Australia is home to some of the driest regions in the world, while also being subject to periods of heavy rainfall and cyclones. It experienced one of the worst droughts in its history between 2003 and 2012, however, has since seen an increase in average rainfall. From the El Niño and La Niña phenomena to subtropical high pressures, there are many factors influencing the weather patterns in Australia and affecting the various Australian regions in different ways. Below is an interactive rainfall map of Australia that allows you to click through into each city and town to learn the average mm of rainfall per year, as well as the average number of rainfall days per year. We have also created an interactive chart of the Average Rainfall per year in Australia which spans from 1900 – 2017, with an accompanying document of the data in table format. 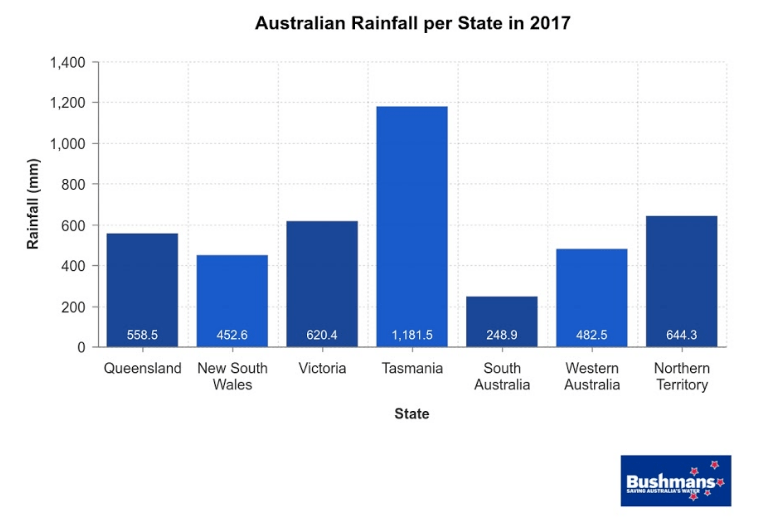 We then dug a little deeper into the Australian rainfall per state and month in 2017, plus the reasons why Australia is such a dry country, and more. In the interactive rainfall map below, you are able zoom in and click through into each city or town to view the average rainfall, as well as the average number of rainfall days for that location per year. It’s easy to see that coastal areas are exposed to much heavier rainfalls, while the central desert regions in South Australia and Western Australia are far dryer. This data was gathered from the Australian Bureau of Meteorology, among other sources, which can be viewed in table format here. 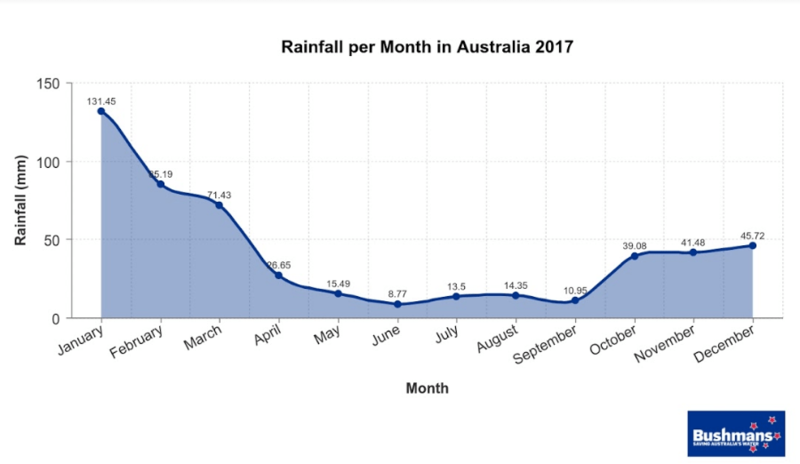 As can be seen in the graph below, rainfall in Australian has actually seen a slight increase from 1900 – 2017. This is due to uncharacteristic weather patterns which resulted in events such as tropical cyclones, as well as a general increase in the number of days of rainfall in certain areas especially northern Australia. As far as future predictions go with regards to Australian rainfall, it’s unconfirmed whether there will be a general increase or decrease across the country. Rather, varied changes across different regions are expected, as will be explained in more detail. This data was gathered from the Australian Bureau of Meteorology on their page here, which links to this data set. This data set can be viewed in a cleaner format here. As we can be seen in the graph below, Tasmania was undoubtedly the wettest Australian state in 2017, as it usually is. Although in 2017, average rainfall in Tasmania was 15% below average when compared to the mean average rainfall in Tasmania from 1961 – 1990 2. The Tasmanian city of Queenstown is one of the wettest places in the whole of Australia, experiencing about 150 days of rain per year. South Australia is usually the driest state in Australia, with 2017 being no exception. Last year was actually a wetter than usual rainfall year for South Australia, with an average rainfall of 248.9mm, which is 11% above the long term average for South Australia (the average again taken from 1961 – 1990). South Australian city Adelaide only experiences around 50 days of rainfall per year, while areas more central like Oodnadatta and Coober Petty only experience about 15 days of rainfall per year. The original source of this data can be found here. One of the driest areas in Australia however, is Birdsville in Queensland. The desert town experiences only 10 days of rainfall per year. Although going further up North in Queensland, areas in Bamaga and Weipa are subject to much heavier rainfall, with about 75 rainfall days per year. As can be seen in the graph below, January was an extremely wet month for Australia in 2017. While January is normally the wettest month in Australia, in 2017 it experienced an estimated 63% more rain than the average rainfall in January between the years 1961 – 1990. February and March followed a similar trend, experiencing slightly more rain than usual. This was however to a much smaller extent. As expected, rainfall increased for the last 3 months of the year, October to December, with only December experiencing slightly less rain than the December average. Why is Australia such a dry country? One of the main reasons for Australia being such a dry country is its location on the map. 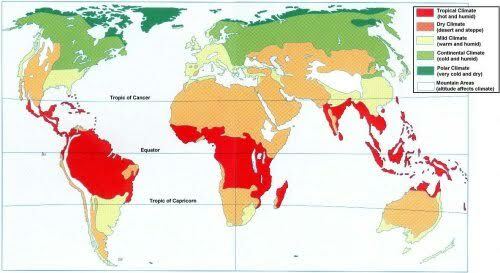 And more specifically, where it lies in relation to the equator and the two latitudes: the Tropic of Cancer and the Tropic of Capricorn, which is where subtropical high pressures occur, as can be seen in the red shaded areas in the map below. This is close to where the Australian desert regions fall. You’ll also notice that this is where the majority of the world’s major desert regions are located, including the Sahara Desert in Northern Africa, as well as the Atacama Desert in South America which has one of the lowest rainfalls in the world 5. In this region of subtropical high pressures, the air that forms around the equator rises higher than usual, before eventually lowering again. In this process, the moisture in the air is lost and it warms due to a phenomenon known as compressional heating. Combined with a lack of strong winds which would blow in some moisture from nearby storms or oceans, countries, like Australia, lying in subtropical high pressure areas remain extremely dry 6. El Niño is a natural phenomenon which perhaps has one of the most powerful impacts on Australian climate. It forms part of a natural cycle which involves the warming of the ocean, resulting in decreased rainfall. The subsequent phase of this occurrence is known as La Niña, which is the cooling of the ocean 7. The El Niño phase occurs when ocean temperatures in the Pacific become significantly warmer than usual, resulting in a change in atmospheric circulation 8. This phenomenon occurs at inconsistent intervals of 2 to 7 years, and can last between 9 months and 2 years at a time. Under normal conditions (left), the Pacific Ocean experiences strong winds which blow from West to East, which pushes warm water towards Australia. 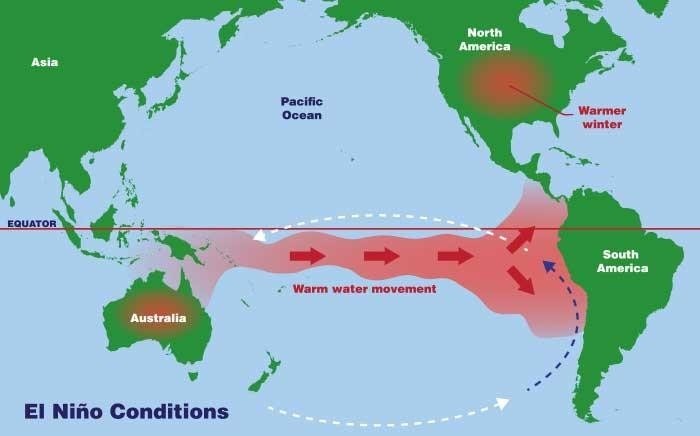 This results in the ocean around Australia to increase in temperature, which adds extra heat to the air. This heat rises (as heat does), and forms clouds in the air, resulting in increased rainfall. 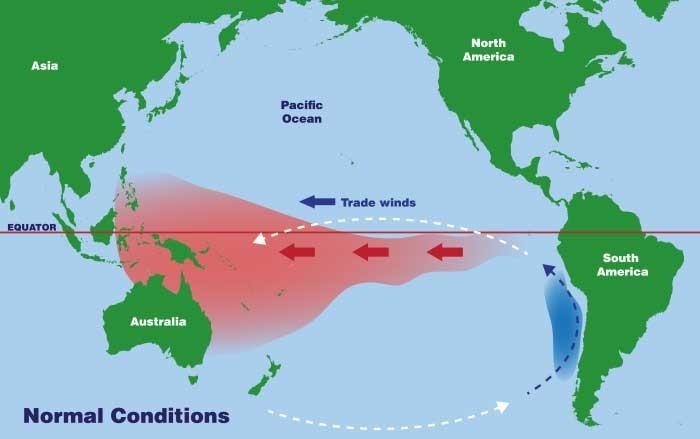 When El Niño occurs, on the other hand, the opposite happens, with strong winds blowing from East to West (away from Australia), resulting in cooler ocean temperatures on the Australian coast, and therefore less cloud formation and rain. El Niño, therefore, has different effects on different regions of the world, but in Australia it results in less rainfall, warmer temperatures, greater natural fire tendencies, and reduced tropical cyclones, ultimately resulting in an overall drier country. Australia has been subject to spouts of drought for hundreds of years, with records showing that since the 1860s, severe drought occurs in the country on average every 18 years. The worst drought to ever affect Australia occurred fairly recently, between the years 2003 – 2012 9. One of the main causes of drought in Australia is the lack of rainfall during certain periods, such as during an El Niño phase, as mentioned previously. Another main reason has been found to be of a man-made nature, however. Australia has seen a decline in rainfall over the past 40 years during the winter and autumn seasons, with a scientific study by Nature Geoscience showing that this is due to greenhouse gases depleting the ozone layer. A scientific model used in the study predicts up to a 40% decrease in Australian rainfall over the next 40 years. Despite suffering through periods of drought, flooding is a fairly common occurrence in parts of Australia and has been for a number of centuries, resulting in average damages of around $350 per person every year 10. The most severe Australian flood on record occurred in Gundagai, NSW, as far back as 1852, which took the lives of 89 people 11. The second most severe flood occurred relatively recently in December 2010, which took the lives of 35 people in Brisbane and South East Queensland, and resulted in damages of over $2 billion. The most common cause of floods in Australia is extreme rainfall, which can be caused by the La Niña phenomenon which is the natural cooling of the ocean, resulting in heavy and above average rainfall. This is the subsequent phase of the El Niño phenomenon, which was discussed earlier as the natural warming of the ocean. This sometimes results in Northern Australia being subject to severe tropical cyclones, resulting in serious flooding. According to projections made by the Bureau of Meteorology in 2015, Australia is expected to see an increase in average temperature of between 0.6° and 1.7° Celsius by the year 2090, under the assumption of a great reduction in the global emission of greenhouse gases 12. To put these projected increases in context: the average temperature in Australia has increased by 0.9° over the past century, since around 1910. Without a significant global reduction in the emission of greenhouse gases, Australia is projected to experience an increase in average temperature of between 2.8° and 5.1° Celsius by the year 2090 13. This projected increase in average temperature under the conditions of a continuous emission of greenhouse gases is fairly close to the global average increase of between 2.6° and 4.8°. The more central areas of Australia will, however, experience higher temperature increases when compared to the coastal areas closer to the ocean 14. The South: The mainland in Southern Australia is likely to see a decrease in average rainfall, but it’s possible that average rainfall in Tasmania will increase. It’s also very likely that the duration of droughts will increase in Southern Australia, as well as an increase in natural fires 15. The North: It has been difficult to predict an increase or decrease in Northern Australia, with CSIRO expecting there to be great variability as a result of greenhouse gas emissions over the next 10-15 years 16. As far as a prediction goes for 2090, it’s again unclear whether there will be an increase or decrease in rainfall, but significant changes in either direction are possible 17. The East: Research shows a medium confidence in average rainfall seeing a decrease by the year 2090. But for the next 10 – 15 years, it’s said that variability in rainfall changes will be more likely than a set change in either direction 18. As can be seen above, projected by the Bureau of Meteorology and the Commonwealth Scientific and Industrial Research Organisation (CSIRO) shows that there won’t be a general increase or decrease in rainfall across the whole of Australia, but rather varied changes across different regions. While the overall trend seems to have increased slightly over the past 100 years or so – meteorologists are unsure whether this trend will continue or not 19.